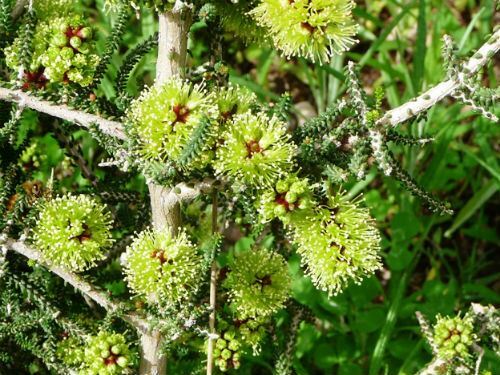 Melaleuca blaeriifolia is a small, spreading shrub that reaches a height of one metre with a similar spread. The small leaves are oval, may be spirally arranged around the branches and are bright green. Small flower heads are yellowish-green to green. They may be carried on the ends of branches or on old wood. Flowering extends through spring and summer. Sporadic flowering may occur at other times. Fruits are small, cylindrical and carried in clusters. Plants appreciate light pruning after flowering. Growth habit, foliage and flowers are all attractive features. Melaleuca blaeriifolia is small enough to be accommodated in most gardens. Rockeries and native cottage gardens would be ideal situations for this interesting species. Melaleuca blaeriifolia comes from the southwest corner of Western Australia and was described in 1847. The species name means similar to the Blaeria genus, heath-like plants from South Africa. Propagate from seed or cuttings. We prefer cutting propagation because plants flower sooner than seed grown plants. Cuttings produce roots rapidly.